From our research, we've found digital marketers wear hats as project managers, web designers, financial analysts, field specialists and content strategists to name a few! Clearly, you're busy throughout the workday. All you truly care about is getting more qualified leads to your sales team, who can use sales productivity tools to close more deals. Yet, generating more customers requires nurturing your leads until they're ready to purchase. Here lies the opportunity to handle this chaos automatically with software. HubSpot, a leading inbound marketing platform, is a popular choice for digital marketing experts. They use the platform to nurture leads with personalized content. HubSpot integrations allow digital marketers to connect with their existing software to automate digital marketing efforts. Click here to see how our custom HubSpot integration is helping marketers automate work. By the end of this post, you'll know the most popular HubSpot integrations for marketing automation. Let's dive into the details. We all know Eventbrite is a convenient way to manage our tickets to concerts, festivals, and all kinds of events. For businesses that focus on live events, HubSpot integrates with Eventbrite to better nurture leads. Registrants and leads generated through offline data are synced into HubSpot, making it easier to track and provide content to your valuable guests. As the name suggests, GoToWebinar hosts webinars and online conferences. Customers rave about the software, as it is rated #1 for customer satisfaction. If you're interested in conducting smoother webinars, HubSpot offers this integration to sync registrant and attendee data. You can also segment contact lists, automate emails and follow-ups, and nurture leads before and after your webinar. Whenever a potential lead bounces from my landing page, I feel sick to my stomach. I worked way too hard to miss that opportunity. Luckily, Unbounce, a platform for A/B testing landing pages, is available to integrate with HubSpot. You can smoothly manage and nurture leads from Unbounce to improve your conversion rates. Privy helps you grow your email list with opt-in forms that convert visitors to leads. By integrating Privy with HubSpot, you can instantly capture converted leads into HubSpot's CRM. From there, you can further nurture leads through segmentation and automate email and other marketing campaigns. Looking to create an amazing content experience for each part of your buyer's journey? Look no further than Uberflip. 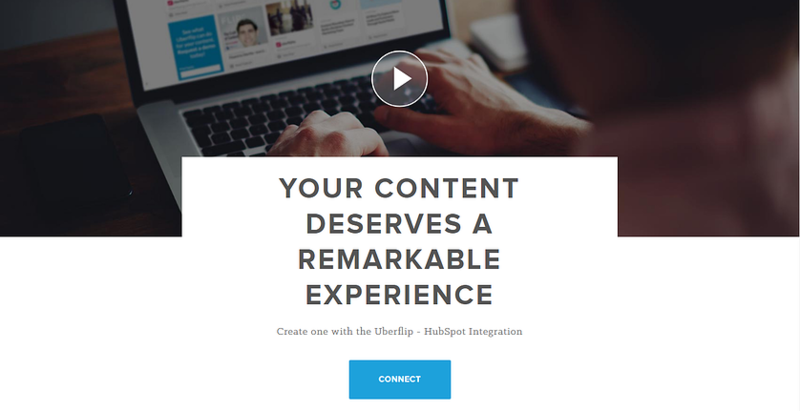 Known as a "Content Experience Platform", Uberflip integrates with HubSpot. The two main purposes of this integration iare to organize content around different buyer personas and prospects and sync CTAs on Uberflip to HubSpot landing pages and smart lists. If you haven't heard about LeadsBrige, here's the essence of the company: they connect your outbound marketing efforts with Facebook Lead Ads. Leads generated from Facebook Ads are automatically sent to HubSpot. This integration stands out for its ability to target highly specific audiences. By syncing smart lists from HubSpot with Custom Audiences from Facebook, you can put your ads in front of specific users and improve your sales, marketing, and re-targeting efforts. LeadPages lets you build responsive landing pages, web forms, and other documents to capture leads. The best part about the software is that you don't need to know HTML or web design skills. HubSpot integrates with LeadPages to feed new leads into HubSpot for future nurturing. Connecting with other popular web services in HubSpot automates your lead generation and nurturing efforts. Companies looking to create highly personal content for their current and potential customers turn to BrightInfo. This engine connects your visitors with content most relevant to them across all your digital channels. The BrightInfo integration with HubSpot dynamically matches your content with your visitor's intent. This type of B2B predictive marketing analytics has increased online conversions for clients by an average of 30%-50%. You can mark leads from BrightInfo in HubSpot to segment marketing offers to unknown visitors and qualified leads. You can see why over 21,000 loyal customers use HubSpot to automate their marketing efforts. In fact, websites with the highest traffic often integrate HubSpot and WordPress. Let's wrap up what we learned. Digital marketers can get more done by using software that enables marketing automation. They typically use popular HubSpot integrations to generate and nurture more leads. Automating your marketing depends on a deep understanding of your ideal customer. Learn below how a custom HubSpot integration can connect your apps for smoother, automated communication. Have you found any other HubSpot plugins helpful to digital marketers? Share your knowledge in the comment section.